Monells belongs to one of the three centres which form one of the largest municipalities in Catalonia: Cruïlles (1), in the region of the Baix Empordà. 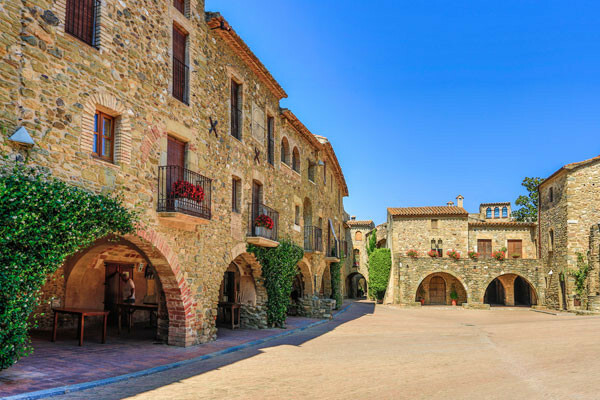 With a population of nearly 200 (2), Monells is a charming village which has often appeared on the cinematic stage due to its picturesque square, probably one of the most photographed in the Empordà. The centre of Monells, full of narrow, cobbled streets is divided by the stream del Rissec creating two separate districts: the Castle district and the la Riera district, both well worth a visit. Monells (as well as the adjacent villages) offers a vast range of cultural and popular activities as well as festivals within reach of everyone: the Festa Petita, Senglanada, Jazz Concert, the Town Festival or the Parade of the Kings at Christmas, as well as markets and fairs dedicated to local products. The Castle district is articulated around the plaza Major (main square), which stands out due to the grand arcade that presides it. Although there are hardly any remains of the old castle, one can see the original medieval walls as well as the Gothic church of Sant Genís. There are various routes available for hiking lovers to enjoy the surrounding area (Sant Pellaia, Sant Cebrià dels Alls or Sant Cebrià de Lledó). With the characteristic personality of the Empordà’s gastronomic tradition the restaurants of Monells, and those of the adjacent villages offer residents and visitors alike a range of culinary proposals to fit all tastes: from sautéed and stewed meats through to rice dishes and fideuàs or fish and shellfish, always accompanied by the best wines of the region and country.